I’m hoping to roll out as many healthy appetizers and desserts as time will allow in December. Partially for selfish reasons; if I make cupcakes, I eat cupcakes. Partially for the purpose of sharing healthy options during this potluck heavy month and partially to show that there are other options in December than sugar cookies. I think I have mentioned before that I’m not a chickpeas and lentil chick. I’m more of a butter and salt gal that needs a change. Now I am taking note from a majority of the globe and leaning lentil. 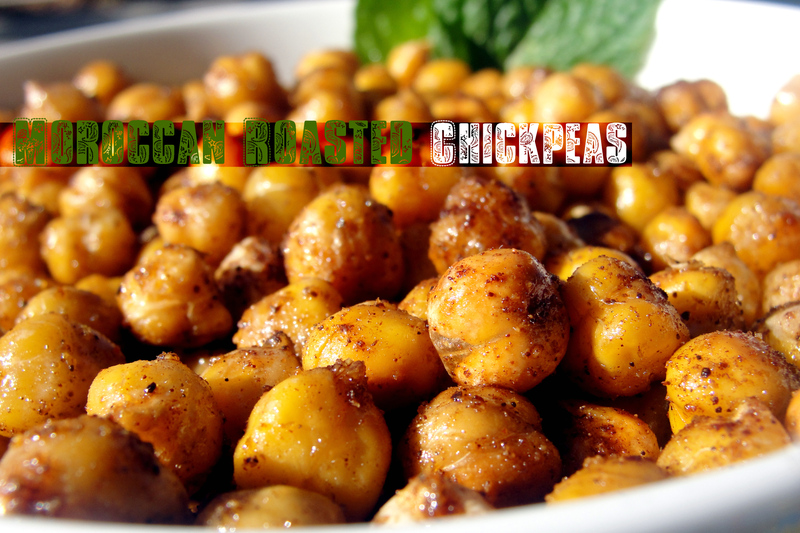 Roasted chickpeas are purported to be a great popcorn replacement (for us protein challenged) and a super snack that leaves no trace of guilt. I have finally jumped on board. The local Indian store, Mirch Masala, is stocked with bags and bags of dried chickpeas. I bought a giant bag of the dried garbanzo beans for $2.99, which is the equivalent to three 15 oz. cans on sale at a large grocery store. This bag is probably a good five or six cans worth of beans. As with all beans, the hassle of soaking overnight seems to be more of a mental issue than a physical chore. Be sure to cover your chickpeas with lots and lots of water if you bought the dried variety, they are thirsty little suckers! Preheat oven to 350 degrees. Rinse, drain and pat beans dry. Mix olive oil and spice mixture and let roast for 40 minutes. You’ll know they are done when they scream like little lobsters. It’s hilarious. Don’t believe me? Test it out, it’s awesome. Added bonus, they are four-year old approved! I have a second batch with cinnamon and sugar roasting right now. When I took my first taste, I was disappointed at the lack of zing. I took my second and third thinking I did something wrong. Half a bowl of chickpeas later, I realized they are in fact, healthy popcorn beans. Totally addicting! These were created using a recipe from Kalyn’s Kitchen. Check out her blog and learn why these are a million times better for you than a cupcake.